When the Genesee Valley Canal was being dug in the 1840's, workers disturbed the natural drainage in what is now know as the "Slide Area", just below the Middle Falls. The upper layers of the gorge wall consisted of glacial till left over from the last ice age. When workmen removed the natural vegetation and top soil as they dug the canal, land slides began to plague the project. During Canal days there were two wooden "trunks" or aqueducts that protected the canal. When the Genesee Valley Railroad was built later, the area presented a constant problem. Later, when the Pennsylvania RR used the tracks, constant slides made it necessary to keep machinery nearby to keep the tracks clear. In the photo, a crane can be seen at the left side of the slide area. 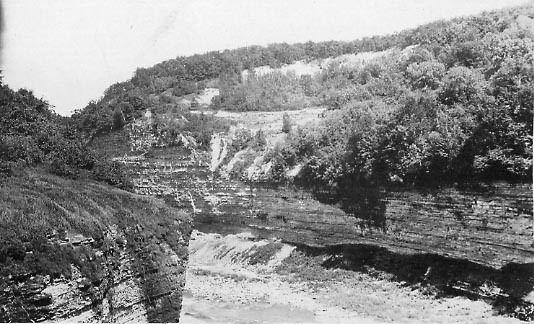 This image, looking northeast from the west bank near the Middle Falls, shows the problem around 1920. Landslides in this part of the gorge are still common today.